Filmmaker Robert Orlando vividly portrays the remarkable story of General George S. Patton, by revealing the people who opposed and thwarted him. The lesson of his rise and fall during World War 2, has never been more relevant than it is right now. Patton was a triumphant warrior who warned—loudly and insistently—that leaving Eastern Europe in Soviet hands, despite Stalin’s peaceful pledges, would betray an American promise. The tragedies of the Cold War that followed proved him right. And though the Berlin Wall would eventually fall, once again, with Putin in power, Russia looms as a formidable enemy. ​The facts of Patton’s life are a warning shot from history. He left a legacy of how to fight—and how not to fight wars. 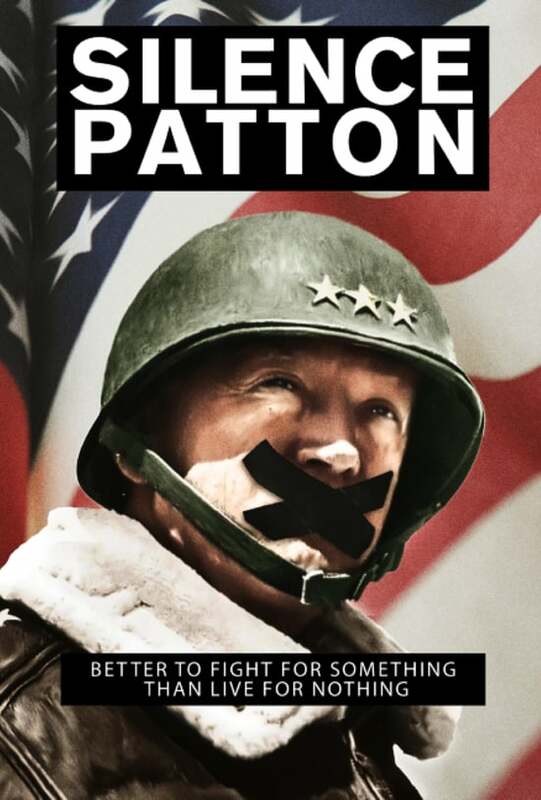 Silence Patton: The First Victim of the Cold War exposes why our most successful general was held back with his troops when victory in Europe was within our grasp. Why was he was ordered to stand down and let the Red Army take Berlin? Why was his fiery rhetoric against politicians and commanding generals ignored? And is it possible that his untimely death was the result of more than just an auto accident? While the film explores these haunting questions it also illuminates a complex man. Patton was not merely the granite-hard, insubordinate general we think we know. He was also a heartfelt, spiritual warrior, a man of great intellect, with political foresight that informed his unrivaled combat expertise. 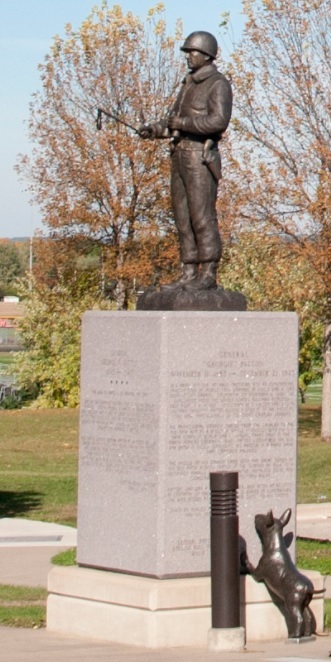 Off to the left of the Eisenhower statue and behind the F-16 Jet memorial, you'll see a memorial and statue honoring General George S. Patton, with his dog Willy at its base The Patton memorial depicts General Patton addressing his troops at Bastone. One of the most complicated military men of all time, General George Smith Patton, Jr. was born November 11, 1885 in San Gabriel, California. He was known for carrying pistols with ivory handles and his intemperate manner, and is regarded as one of the most successful United States field commanders of any war. He continually strove to train his troops to the highest standard of excellence. Nicknamed "Old Blood and Guts" due to his ruthless drive and apparent lust for battle, he wrote home to his wife, "When I’m not attacking, I get BILL-YUS - bilious." 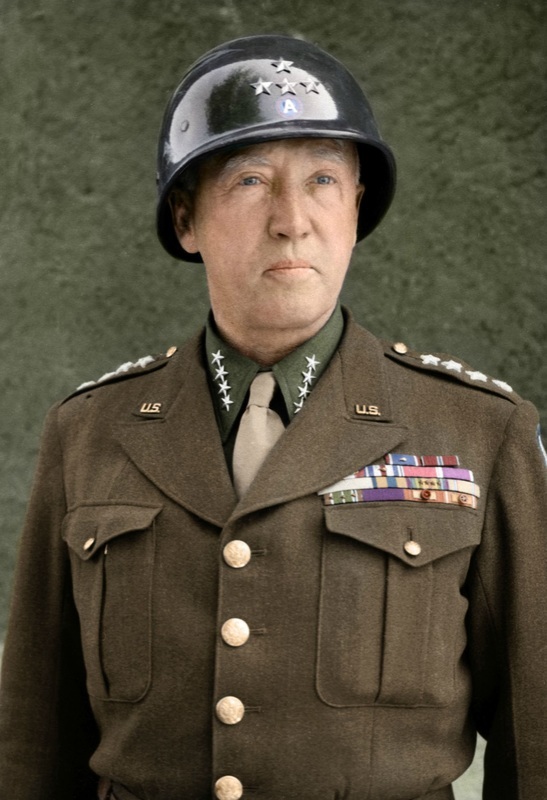 George Smith Patton, Jr. (November 11, 1885 – December 21, 1945) was a general in the United States Army, best known for his command of the Seventh United States Army, and later the Third United States Army, in the European Theater of World War II. Patton led U.S. troops into the Mediterranean theater with an invasion of Casablanca during Operation Torch in 1942, where he later established himself as an effective commander through his rapid rehabilitation of the demoralized U.S. II Corps. He commanded the Seventh Army during the Invasion of Sicily, where he was the first allied commander to reach Messina. There he was embroiled in controversy after he slapped two shell-shocked soldiers under his command, and was temporarily removed from battlefield command for other duties such as participating in Operation Fortitude's disinformation campaign for Operation Overlord. Patton returned to command the Third Army following the invasion of Normandy in 1944, where he led a highly successful, rapid armored drive across France. He led the relief of beleaguered U.S. troops at Bastogne during the Battle of the Bulge, and advanced his army into Nazi Germany by the end of the war.After the war, Patton became the military governor of Bavaria, but he was relieved of this post because of his statements on denazification. He commanded the Fifteenth United States Army for slightly more than two months. Patton died following an automobile accident in Europe on December 21, 1945.Patton's colorful image, hard-driving personality and success as a commander were at times overshadowed by his controversial public statements regarding the Soviet Union which were out of accord with American foreign policy. But his philosophy of leading from the front and his ability to inspire his troops with vulgarity-ridden speeches, such as a famous address to the Third Army, attracted favorable attention. His strong emphasis on rapid and aggressive offensive action proved effective. While Allied leaders held sharply differing opinions on Patton, he was regarded highly by his opponents in the German High Command. A popular, award-winning biographical film released in 1970 helped transform Patton into an American folk hero. 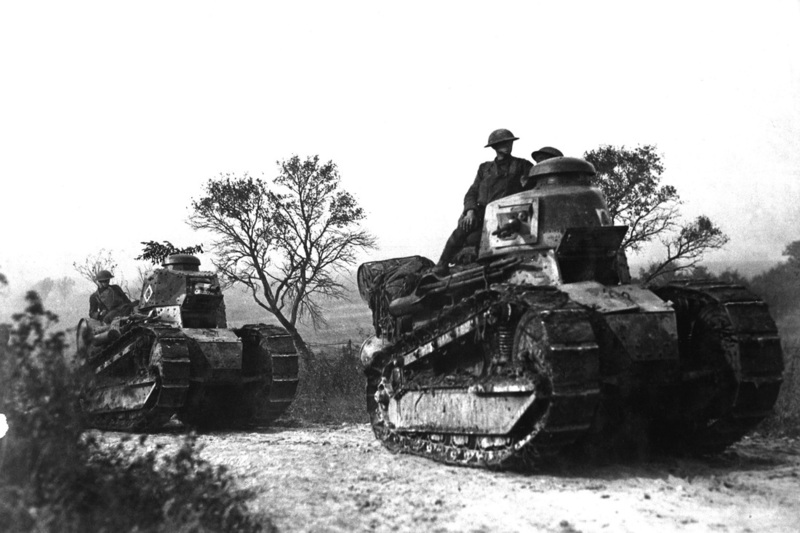 World War II Following the invasion of Poland and the outbreak of World War II in Europe in 1939, the U.S. military entered a period of mobilization, and Patton sought to build up the power of U.S. armored forces. During maneuvers the Third United States Army conducted in 1940, Patton served as an umpire, where he met Adna R. Chaffee, Jr. and the two formulated recommendations to develop an armored force. Chaffee was named commander of this force, and created the U.S. 1st Armored Division and U.S. 2nd Armored Division as well as the first combined arms doctrine. He named Patton commander of the 2nd Armored Brigade, 2nd Armored Division. 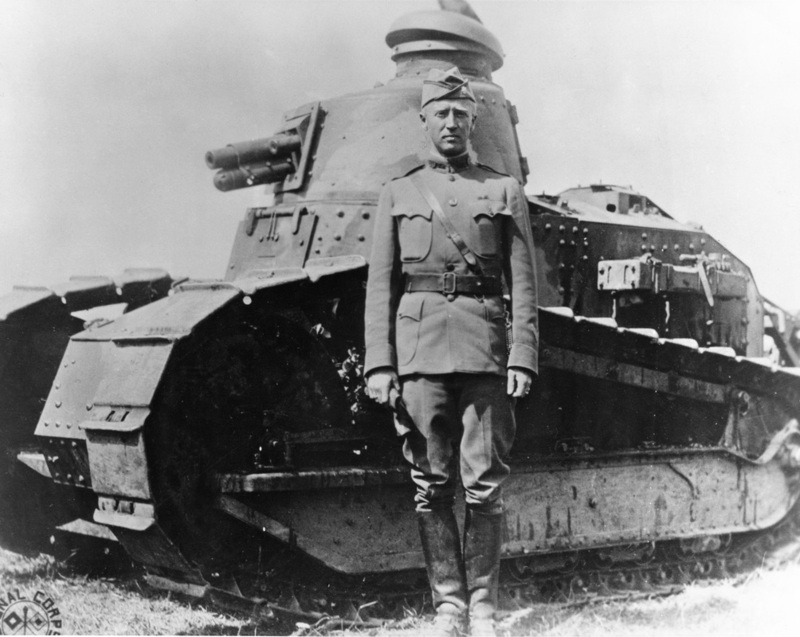 The division was one of few organized as a heavy formation with a large number of tanks, and Patton was in charge of its training. Patton was promoted to brigadier general on October 2, made acting division commander in November, and on April 4, 1941 was promoted again to major general and made division commander of the 2nd Armored Division. As Chaffee stepped down from command of the U.S. I Armored Corps, Patton became the most prominent figure in U.S. armor doctrine, staging a high-profile mass exercise driving 1,000 tanks and vehicles from Columbus, Georgia, to Panama City, Florida, and back in December 1940, and again with his entire division of 1,300 vehicles the next month. Patton earned a pilot's license and during these maneuvers he observed the movements of his vehicles from the air to find ways to deploy them effectively in combat. His exploits earned him a spot on the cover of Life Magazine that year. 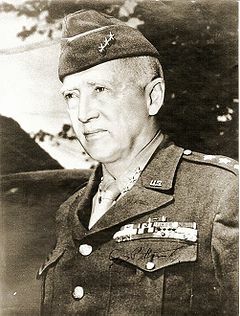 Patton led the division during the Tennessee Maneuvers in June 1941, and was lauded for his leadership, executing 48 hours' worth of planned objectives in only nine. During the September Louisiana Maneuvers, his division was part of the losing Red Army in Phase I, but in Phase II was assigned to the Blue Army. His division executed a 400-mile (640 km) end run around the Red Army and "captured" Shreveport, Louisiana. During the October–November Carolina Maneuvers, Patton's division captured Hugh Drum, commander of the opposing army. On January 15, 1942 he was given command of I Armored Corps, and the next month established the Desert Training Center in theImperial Valley to run training exercises. He commenced these exercises in late 1941 and continued them into the summer of 1942. Patton chose a 10,000-acre (40 km2) expanse of desert area about 50 miles (80 km) southeast of Palm Springs. 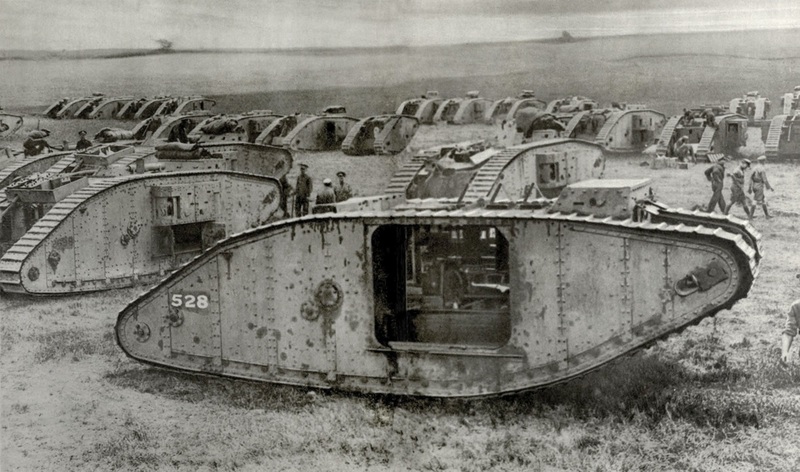 From his first days as a commander, Patton strongly emphasized the need for armored forces to stay in constant contact with opposing forces. His instinctive preference for offensive movement was typified by an answer Patton gave to war correspondents in a 1944 press conference. 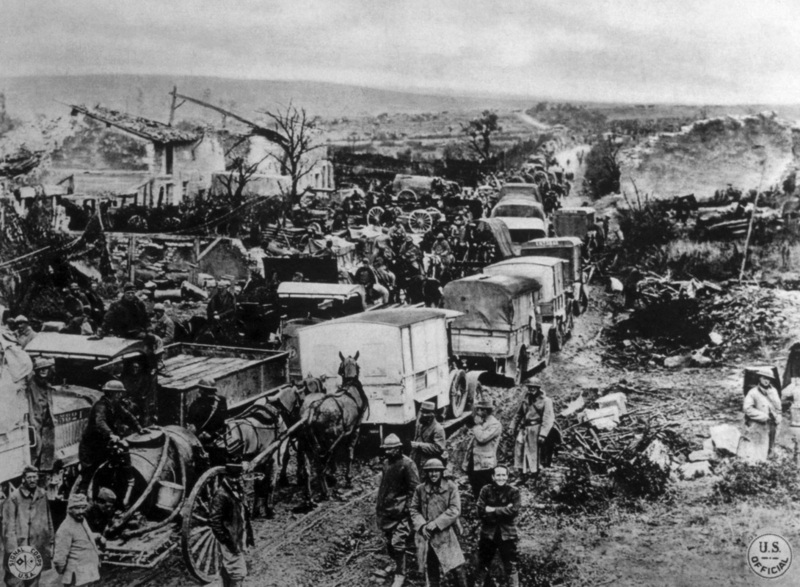 In response to a question on whether the Third Army's rapid offensive across France should be slowed to reduce the number of U.S. casualties, Patton replied, "Whenever you slow anything down, you waste human lives." During the war, Patton acquired the nickname "Old Blood and Guts," because of his enthusiasm for battle;soldiers under his command at times quipped, "our blood, his guts". Still, he was known to be admired widely by the men under his charge. 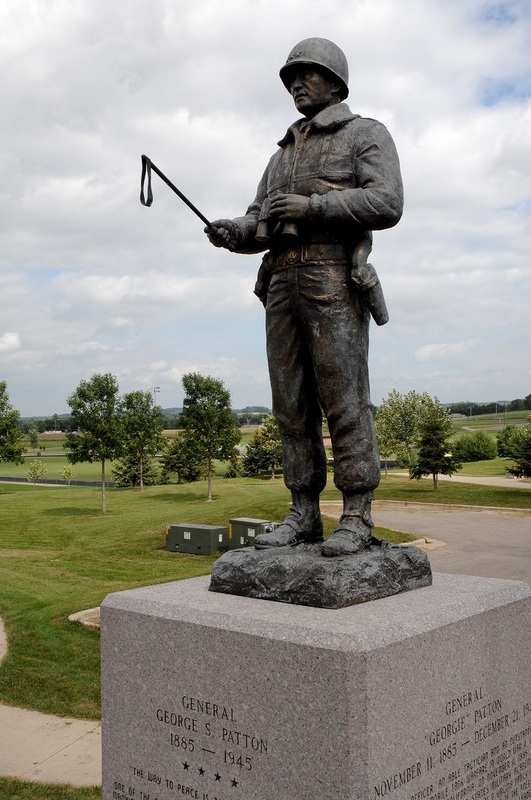 Patton was also known simply as "The Old Man" among his troops.